The standard for homework set by educators is known as the “10-minute rule.” That means 10 minutes per grade level per night (ie: first graders get 10 minutes, 8th graders get 80 minutes), with recommendations for no homework for kindergarteners. A new study of over 1,000 primary and secondary grade students found that kids are actually being assigned up to three times the recommended amount of homework, with parents of kindergarteners reporting 25 minutes of nightly homework. So what’s the big deal about a little extra academic time, aside from the inevitable moaning and groaning from your kids? Unfortunately, the extra homework and time spent on it comes at a potentially high cost. The U.S. ranks among the high range regarding homework expectations: France, South Korea, and Japan log at least an hour to several hours less a week for the typical 15 year-old student, and Finnish teens spend less than half the time U.S. students do on homework (2.8 hours vs. 6.1). All that homework may not be improving our education systems: in a 2014 ranking, the U.S. was 14th (behind Finland, Japan, Canada, and South Korea, by the way). Grades and performance aside, the extra homework could be detrimental in other ways. For undereducated parents who lack confidence in their ability to help their children academically, homework time became extremely stressful. According to the study, fights and conflicts over homework were 200% more likely in families where parents did not have a college degree. Children of parents for whom English is not a first language also faced additional homework obstacles. Furthermore, too much homework takes away from the oft-overlooked, but very necessary unstructured play that kids would otherwise engage in after school. 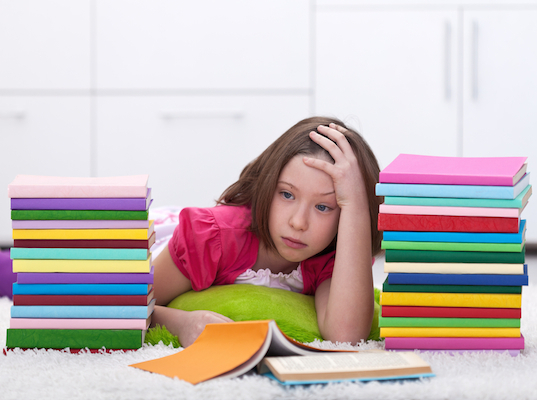 The standard for homework set by educators is known as the "10-minute rule." That means 10 minutes per grade level per night (ie: first graders get 10 minutes, 8th graders get 80 minutes), with recommendations for no homework for kindergarteners. A new study of over 1,000 primary and secondary grade students�found that kids are actually being assigned up to three times the recommended amount of homework,�with parents of kindergarteners reporting 25 minutes of nightly homework. So what's the big deal about a little extra academic time, aside from the inevitable�moaning and groaning from your kids? Unfortunately, the extra homework and time spent on it comes at a potentially high cost.